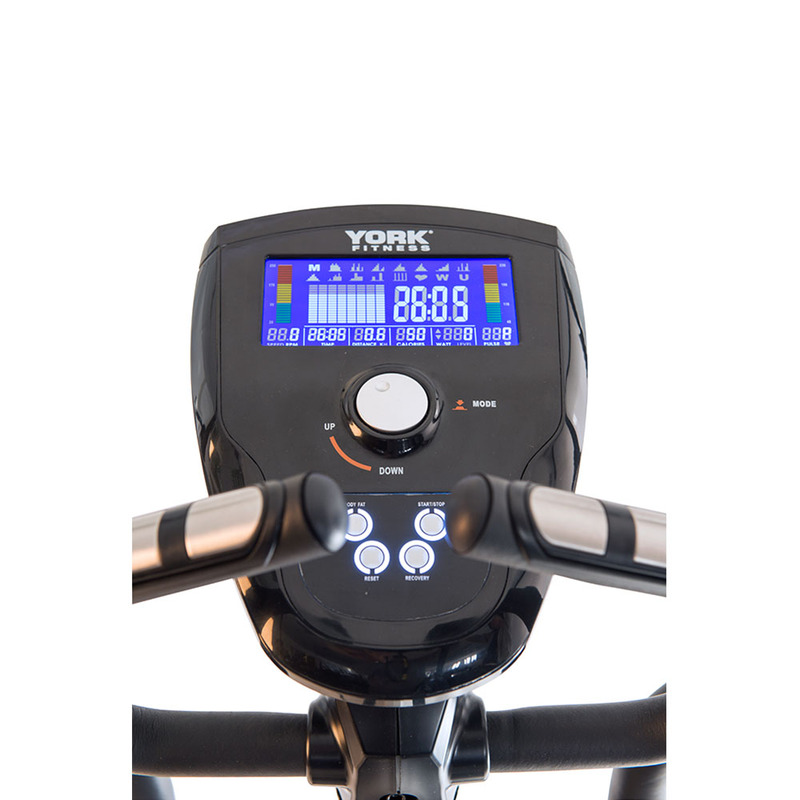 York Fitness are one of the best known brands in the UK marketplace and manufacture cross trainers that cover everything from the really cheap (and sometimes nasty) to upper mid-market elliptical trainers. We were keen to give the Perform 215 a good hammering to see how it stacks up against some fairly stiff competition from brands such as Reebok and Kettler with cross trainers at similar price points. Like most elliptical trainers, assembly is quite time consuming, but the instruction manual is very clear and easy to follow. No real special skills are required to put this elliptical together, just a bit of patience and ideally a second person to help hold bits in place when screwing in various parts. It should be noted that he main body containing the flywheel is supplied in the box as one piece – so nothing particularly complicated needs doing. Once assembled, the look of the machine can really be appreciated: The Perform 215 is a stylish and elegant machine! There was only question in your reviewer’s mind at this stage: what will it feel like to use? Well, the machine feels sturdy and the stride action certainly feels smoother than most similarly priced machines, which is surprising considering the flywheel is advertised as being only 7 kg in weight. We can only assume that York have used high quality, heavy duty components in order to create a much higher rotating mass than the level indicated by the flywheel weight. In addition to feeling smooth, the Perform 215 has a nice, long 15″ stride which feels far more natural than the majority of machines in its price bracket. The machine offers an impressive 32 levels of magnetic resistance (electronically controlled through its easy to use console), and we can confirm that the higher resistance levels really are rather hard! The console has a sleek, glossy black finish with a large, back-lit multi-colour LCD display at its centre. The display is clearly laid out with a number of dedicated segments at the bottom providing continuous display of information such as exercise time, distance, pulse rate, watts (more on this later) as well as calorie consumption. The calorie consumption figures reported are a bit more accurate that those reported by most machines at a similar price point, thanks to the user profile functionality of the Perform 215’s console. Up to 4 separate users can store their age, gender, weight and height and this data is used to increase the accuracy of estimates such as calorie consumption. In terms of programmes, the Perform 215 is certainly not skimping on variety. There are 12 pre-set ones, each of which can be used for a user-defined length of time, as well as difficulty level. The fact the programmes can be scaled for difficulty level is useful as it means this elliptical trainer can continue to provide challenging workouts as the user’s fitness levels improve over time. One of the programmes is a Watt control one and we already mentioned that there is a Watt segment on the console. We’re rather pleasantly surprised to see this functionality, as it’s typically something seen on higher priced machines. This feature makes this cross trainer an ergometer, which is a machine whose resistance levels have been calibrated to accurately reflect a given rate of energy consumption. In effect, you can set the level in watts (same as the units used in light bulbs) and the computer adjusts the resistance level automatically to ensure the target level is maintained. There are also a number of heart rate control programmes available and the console even features a wireless heart rate receiver. This is a feature we’d recommend having for two reasons: firstly, pulse grip sensors don’t provide a particularly accurate heart rate reading (making a heart rate control programme unreliable). Secondly and most importantly, holding the static arms takes away some of the upper body exercise provided by holding onto the moving arms. The Perform 215 has all the extra ‘little touches’ you’d expect from a quality machine such as leg level adjustment to ensure stability on slightly uneven surfaces, transport wheels as well as water bottle holder. The York Perform 215 is not currently available from any retailers we're aware of in the UK. 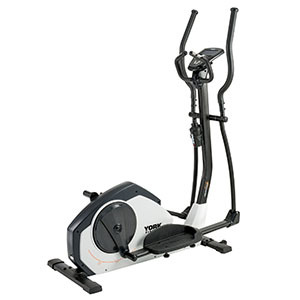 The York Perform 215 is a sturdy, smooth elliptical trainer that has a console with plenty of features such as user profiles for more accurate calorie feedback. It's a solid all-rounder for the home that will be suitable for most of the family and compares really well with anything else at the same price point making it easy to recommend. If you're looking for a 'does what it says on the tin', reliable and sturdy cross trainer that offers excellent value at less than £300 then this is a model that's well worth considering.